Let’s talk about flying to Japan. The first time I flew to Japan, in 2008 for work, I flew American Airlines. It was fine. Economy class is uncomfortable on any flight, and it really wears on you after thirteen hours, but really, who can afford first class? On Japan Air, they serve a special drink, Sky Time. Sky Time is yuzu juice. Yuzu is a Japanese citrus fruit that looks kind of like a tiny grapefruit and it tastes citrus-y…maybe a cross between a lemon and a grapefruit with a little bit of orange? It’s hard to say exactly. But Sky Time is delicious. You can drink it as is or mix it with vodka. Yum. Yuzu juice can often be found at the Japanese grocery store, too, in case you want to try it without suffering through the cost and the backaches of a thirteen hour flight. In September, we flew All Nippon Air. It was comparable to Japan Air in customer service. We didn’t have any swanky upgrade luck, but they did kindly move me to an aisle seat. And, on the flight home when the flight attendant learned that my screen didn’t work, she apologized no less than four dozen times, offered me every magazine on the plane and offered to move me to a seat with a working screen another dozen times. It felt really weird…especially since we never complained about it and then explained that I could just hijack Naoto’s screen because he would sleep anyway. Yet the apologies continued…awkwardly. Oh, and speaking of apologies…we got a little bit off-schedule upon departure at O’Hare and though our pilot tried to make up the time in the air, we were still five minutes late upon our arrive in Japan. The pilot apologized profusely…for five minutes…it’s nice to know that some airlines value my time. I was excited to learn that ANA also has their own signature drink, the Aromatic Kabosu. Kabosu is another citrus (it looks more like a lime but is kind of similar in taste to yuzu) and it is delicious with gin. 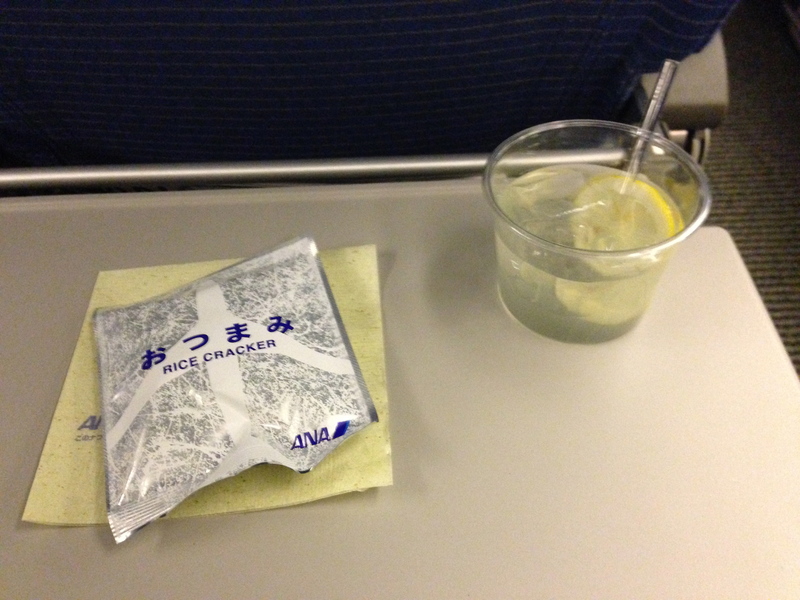 My cocktail is pictured above with my mid-flight rice cracker snack…the mid-flight snacks are my favorites. Kind flight attendants, respect of schedules and signature drinks…more reasons Japan Does It Better in flying! For more JDIB, click here!